Halloween is just around the corner. The exciting night is full of fun costumes and yummy goodies. While it is a festive occasion, it can cause oral health complications, like tooth decay, for your child. Although many tend to believe that one night of overindulgence on candy will not cause any damage, this is not necessarily true. Not to mention, while it may only be one night, your child will have access to large amounts of candy for the next several days, further raising their risk for a cavity. To help you manage how much candy they consume, your pediatric dentist in Birmingham has some excellent tips. If you ask your dentist, they will probably say that any candy is too much; however, your child will likely protest if you ban the goodies altogether. As a rule of thumb, limit their candy consumption to one or two pieces a day for dessert. Make sure they brush and floss well afterward. There are also simple tips to help you protect your child’s teeth without taking away their fun for the evening. Although any candy can lead to tooth decay, those that are sticky tend to cling to the teeth and are more difficult to remove from the crevasses of the molars. This is especially true for children as they often do not clean this area well. As a result, residue from the candy can sit on the teeth long after the night has passed. If it is not removed, it will begin to eat away at the enamel, causing a cavity to form. Instead, it is better to let your child eat candies that are chocolate or melt away because they do not stick to the teeth as much. While you are separating your child’s stash of candy, it is best to toss those that are hard. Not only can they cling to the teeth, but they can also increase their risk for a broken or chipped tooth. If they bite on an overly hard piece of candy, it can lead to a dental emergency that will ruin their night. Many dentists offer a “buy back” program, where your child can turn in their candy to participate in Operation Gratitude and receive a prize bag in return. 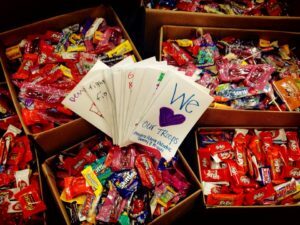 This program sends their candy to troops serving overseas to give them a special surprise while they are away from their families. As Halloween approaches, take the time to make it an educational experience for your child to help foster a healthy and beautiful smile. 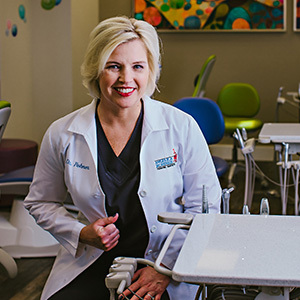 Dr. Angelica Rohner provides pediatric dental care in a caring and friendly office. Due to her extensive training and qualifications, she helps to promote the health and development of young smiles. To help keep the teeth and gums healthy, her office offers a “buy back” program for Halloween candy. If you are interested in learning more, please contact our office.